Step 1 Trim any coarse or discolored parts from the bulb or stalks of the fennel and discard them. The feathery leaves of the fennel bulb are flavorful and add color to the salad. Cut the bulb and ribs (also called stalks) into thin slices. Place the slices in a large salad bowl. Use some of the fennel leaves and add them to the bowl. Step 2 Rinse the radishes and trim away the roots and the stem tops. Thinly slice the radishes and add them to the bowl. Rinse the parsley, shake it free of water and pick just the leaves off and add them to the bowl. In Recipes-list.com we have selected the most viewed recipes from category - Salads . Enjoy the best recipes specially selected for you! 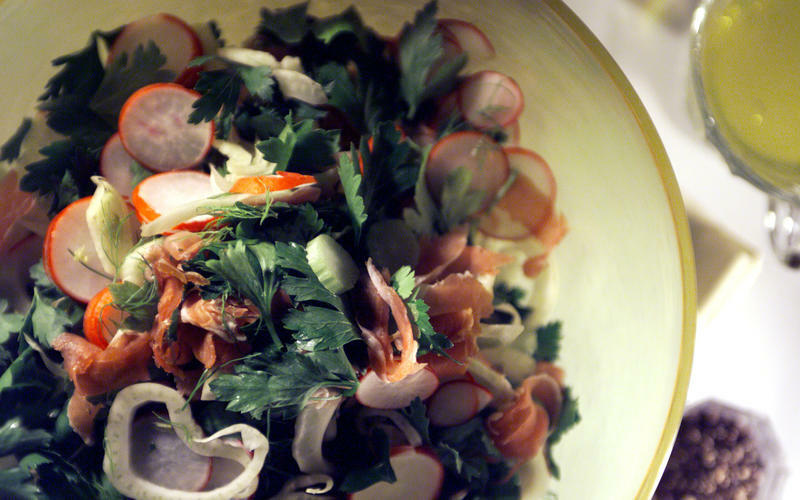 Fennel, Radish and Parsley Salad With Prosciutto is the right choice that will satisfy all your claims.